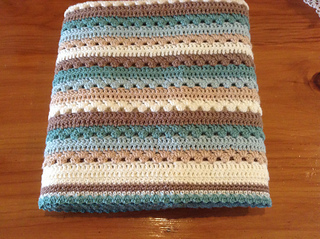 ♥ I have used 15 x 100g balls of Stylecraft Special DK worked on a 4mm hook to make my Cosy Stripe Blanket. ♥ These 15 balls are enough to make a single bed size blanket with a finished size of approximately 4ft x 6ft / 120 cm x 180 cm. ♥ If you crochet loosly, you will need to make sure that your starting chain and first row measures roughly 120cm otherwise you will need more than 15 x 100g balls. It’s fine to reduce your starting chain to achieve the correct size, just remember to make your starting chain a multiple of 3. 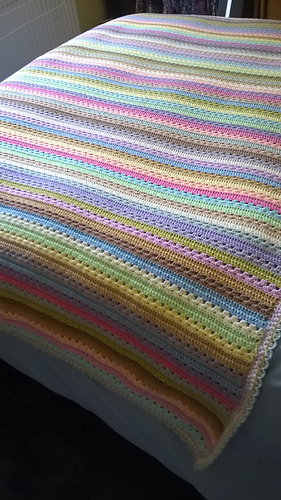 ♥ If you wish to make the blanket bigger, i.e., to fit a double or king size bed, you will need to increase the number of stitches in your starting chain…..the starting chain should always be a multiple of 3. You will also need to purchase extra yarn if you make a bigger size. 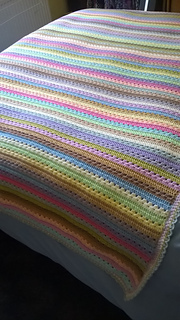 Note that the Cupcake Stripe Blanket is a different color pattern of this blanket.